University of Plymouth is delighted to host the Plymouth U3A Annual Showcase. 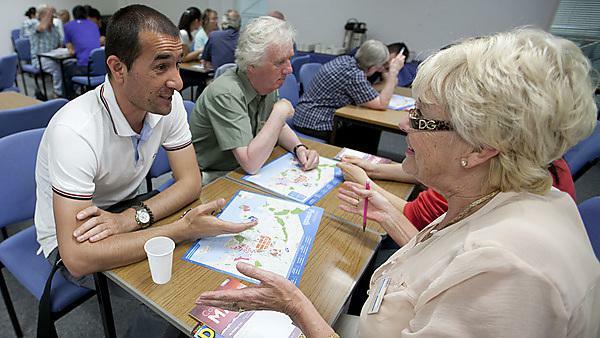 The event promotes the benefits of U3A membership to the public and retiring University members of staff. The University's partnership with Plymouth U3A sees members attending lectures and other events, touring and accessing our facilities, and enjoying bespoke presentations. In return, our U3A partners add real value to the University student and staff experience, for example by supporting international students with their English language skills through the languages café and intercultural exchanges. The Plymouth U3A was founded in 1998 and now has over 800 members and nearly 70 different interest groups. Contact Anne Willingdale, Welcome and Promotion Officer at ambol@btinternet.com for further details of this event. The U3A provides educational, creative and leisure opportunities in a friendly environment, for people no longer in full time employment. It enables members to continue learning and prevents the isolation that can occur at their time of life, deriving enormous health benefits from contact with others. The U3A: encourages and enable people no longer in full-time employment to help each other to share their knowledge, skills, interests and experiences; demonstrates the benefits and enjoyment to be gained and the new horizons to be discovered in learning throughout life; celebrates the capabilities and potential of older people and their value to society, and makes U3As accessible to all older people. This pioneering academic partnership sees members of Plymouth U3A attending University lectures and other events, touring and accessing University facilities, and enabling members to continue learning. Other benefits include support for U3A members with use of new technology and social media, and the annual U3A showcase on campus.